Now that winter has arrived in full force, you may have heard about neighbors or friends dealing with a common problem that results from periods of snowfall and freezing temperatures: ice damming. Icicles along eaves are one of the symptoms of ice damming. An ice dam forms at the edge of your roof when melting snow and ice from the upper portion of the roof collects along the eaves, refreezes and builds up into a dam. The most serious threat is that an ice dam will redirect water back up under shingles, causing water damage to roofing materials and possible interior leaks. 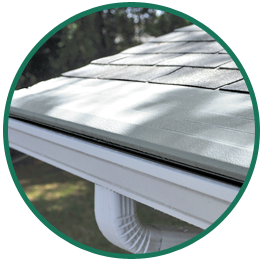 Heavy ice buildup can also weigh down gutters, causing them to pull away from the side of your home. That’s why it’s important to look at heated gutters for your home. A hidden cable system that’s specifically designed for the Gutter Helmet system. Energy-efficient and easy to use. Can be installed by our factory-trained technicians in less than one day. With Helmet Heat installed on your home, snow and ice will melt at the edge of your roof, freely flow into the gutters and away from your home. It’s the simple, affordable solution to expensive ice damage in winter. Huff ‘N Puff is proud to be the official dealer and installer of Helmet Heat in Albany and the Hudson Valley. Contact Huff ‘N Puff today at (855) 483-3678 to request a FREE quote on these products. We’ve got homeowners from Queensbury to Poughkeepsie covered!